Last week we discovered the first five of the bookmarks from the project A Collection. Today I continue with the remaining five bookmarks. Not a very good picture for detail, so let me lift them out. The flash bounced here and it took a few attempts to get a better picture (I still have plenty to learn!). On the left I used a striped patterned fabric for my example of Corded (Italian) quilting. This form of quilting first appeared in the 1930s, it uses two layers of fabric and the design is usually drawn on the back. Two parallel lines of small backstitches form a channel with a soft thick wool threaded on a bodkin pulled through as the filling thread to give the raised effect. I chose to follow the lines of the fabric and added French knots to the centres of the flowers. The centre channel has a single layer of padding while those on either side are double layers. On the right is Carrickmacross lace that I trapped in two layers of acetate finished with machine stitching. This simple sample is of Carrickmacross Lace, made using a layer of machine made tulle and cotton organdie. it would come under the banner of ‘Whitework’ or Fine work. 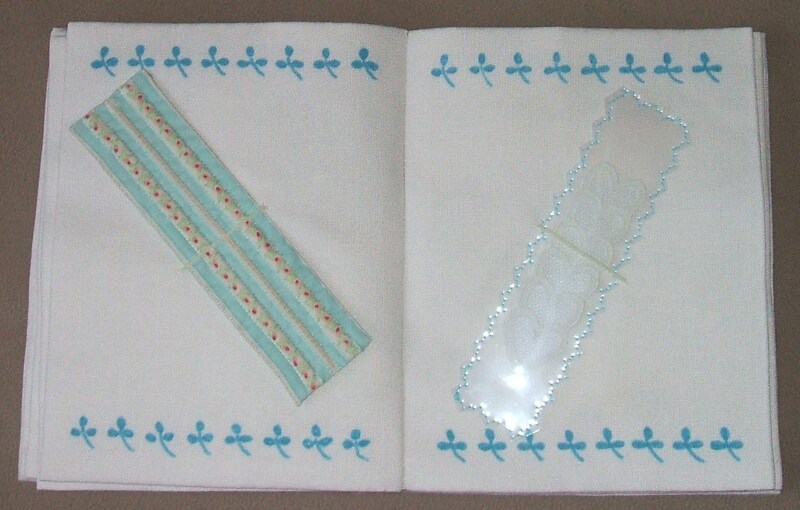 Fine work is sewn on sheer fabrics, such as organdie, lawn, muslin, glass cambric and net. Ayrshire, Carrickmacross, chikan work (from India) Dresden (from Germany) and shadow applique work are examples of fine work. If you like I can come back to Carrickmacross Lace in more detail on another occasion. Turning the page we see my least favourite and included only to even up the number to 10. It is an early experiment in paper making, a process that requires the maker to sport old clothes and be prepared to slop about elbow deep in a mushy mesh! We used shredded paper, fibers and threads and soaked it for several days in water before draining through a screen, so that a mat of randomly interwoven fibers is laid down. The water is removed from this mat of fibers by pressing and drying to make the paper. It is a very slow process and needs plenty of patience. Most paper is made from wood pulp, but other fiber sources such as cotton and textiles may be used. I then spray painted the finished paper, painted the words Book Mark and finished it with blanket stitch in a very find silver thread. 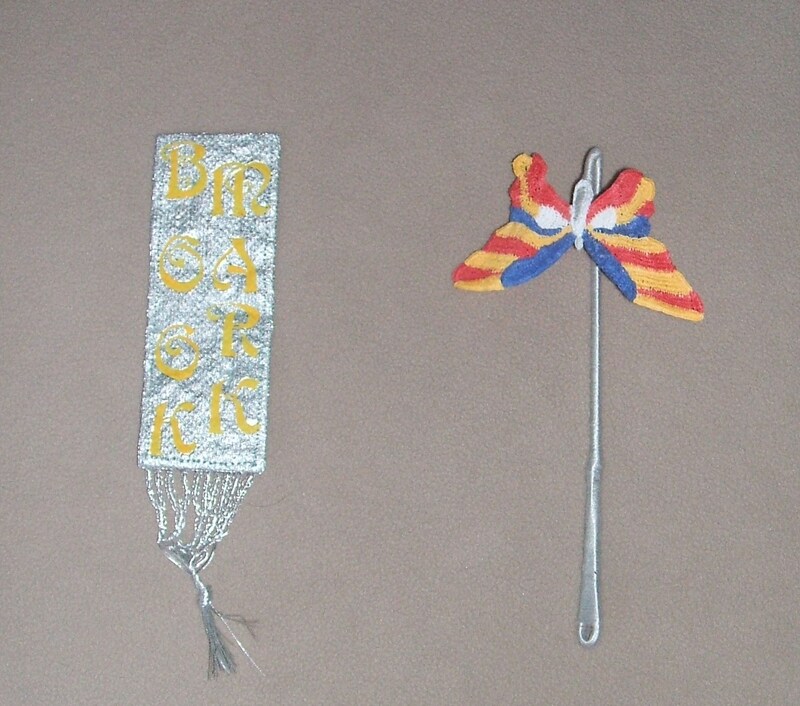 The tassel was made from a variation of the blanket stitch before the threads were knotted at the end. The next bookmark was more to my liking. It is made to hook over the book. The butterfly ( Magpie 11, please don’t ask the variety, it is a GM special!). OK! I confess… I had to take out my magnifying glass to see what kind of stitch I used. It was nearly twenty years ago, and the eyes are not as good as they used to be! The stem was wire wrapped in stranded cotton and the ‘flutterby’ was actually crocheted in stranded cotton using two strands each time and a double crochet stitch, is it any wonder I am half blind! The sheen of the thread was killed by the stiffening solution. I cannot remember what you called it, but I do remember I bought it in Arnotts in Dublin. On to the final page and my absolute favourite for my Bookworm. This last one is Reverse Applique. There are two methods: the traditional San Blas or Mola embroidery and the Cut-through method. 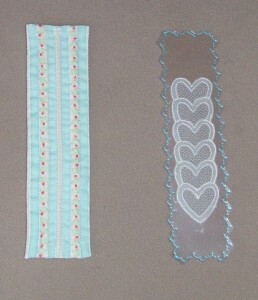 The difference between these two methods is the order in which the layers are cut and stitched. 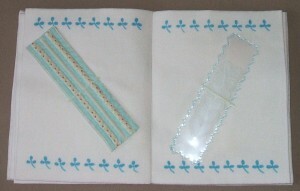 The Cut-through applique is achieved by stab-tacking up to five layers of fabric together, then cutting away shapes to expose the layers below. The bottom layer acts as a backing or lining and never cut. Testing out a pattern with layers of coloured paper is a good way to start. I used felt as it would not fray and the ‘worm’ added for effect was made from four dark grey beads, with two tiny clear beads for eyes. Well he needed eyes to read!! I hope you enjoyed this little collection and next week I have another project to share with you. 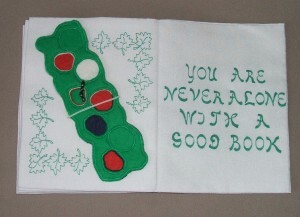 This entry was posted in Crafts on September 2, 2009 by Grannymar.